Did You Know? Monterey is a city of firsts? California’s first capital, home of the state’s first theater and printing press, and the place where the country’s flag was first hoisted in California, claiming the Sunshine State for the United States. Here you are with so many Things To See & Do in Monterey. Attractions, like the world famous Monterey Bay Aquarium with exhibits and animal habitats displaying rare and wonderful sea life. It is an experience you and your family will treasure forever.Did you ever dream of the perfect place to vacation? Beautiful beaches, balmy weather, abundant wildlife, happy people all around you? Your own personal little slice of heaven. Look around and you’ll see what we mean. If you have a soft spot (like we do) for the magnificence of whales, Monterey Bay Whale Watch and Monterey Whale Watching Cruises can take you on unforgettable tours. Don’t forget the Monterey County Fair & Exposition during the month of August along with the many events displaying, buying, selling and just having fun with classic automobiles. The Concours on the Avenue in Carmel-By-The-Sea, Automobilia Monterey or the Concours Tour d’Elegance in Pebble Beach to name only a few. With the Pacific Ocean right in your backyard, the Water Sports abound from swimming, snorkeling, stand-up paddle boarding, scuba diving, kayaking rentals and tours we can guarantee you won’t run out of ways to enjoy the water. Explore the kelp forest and abundant marine life along Cannery Row or Stillwater Cove from an ocean kayak! Rent a kayak or take a guided tour. Or try Stand Up Paddle-boarding and experience this new sport! You can launch from Monterey Bay Kayaks’ location on Monterey City Beach, paddle in the harbor and up along Cannery Row! Their flat rate allows you to come in anytime and paddle as long as you want, at your own pace. Discover Monterey by Land with Bike Rentals and surrey rentals where the whole family can help with peddling from Bay Bikes Rentals Wheel Fun Rentals peddle your way through a beautiful day. A fun nostalgic ride for the whole family. 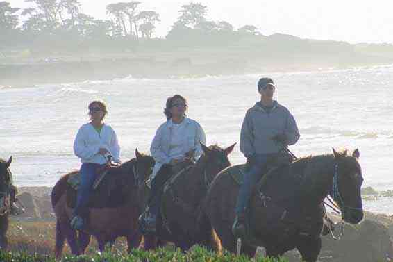 And don’t forget our four legged friends, why not rent some horses to enjoy Horseback Riding with Pebble Beach Trail Rides? Ride on a private beach or through the majestic forest to some of the most breathtaking spots on earth. Enjoy some world class Golfing at Bayonet & Black Horse courses, Carmel Valley Ranch or Poppy Hills. Visit our Area Tours & Wineries page for the hippest places to tour. For example, Monterey Movie Tours: As you glide past sites made famous on the big screen, you’ll hear behind-the-scenes stories of Hollywood glamour. The Scheid Vineyards Wine Lounge in Carmel will welcome you with tours and scheduled wine tasting events or you can visit their wine tasting room in Greenfield. Art Galleries & Shopping why not make a day of it? Monterey has beautiful artwork on display in the many fine galleries throughout the city, top off your day shopping at the Del Monte Center, a shopping mall with everything you might expect, great stores, delicious dining, or catch a movie at the Century Theatres. When it’s time to rest your head, you will be pleased at the Lodging available in the area, choose from Resort & Full Service Hotels – Moderate Lodging – Economy Lodging – Motels & Motor Lodges – Country Inns – Bed & Breakfast Inns – RV Parks & Campgrounds – Reservations Services or Vacation Rentals, something for everyone. A little nourishment can re-start your engines. Dining here is blessed with some of the finest Chefs in the world. If you are in the mood for Seafood, we recommend Old Fisherman’s Grotto, a worldwide reputation for only the finest cuisine in a superb atmosphere or The Fish Hopper, within walking distance to The Monterey Bay Aquarium and specializing in Fresh Seafood and Steaks both located in Monterey. Why not let Fandango’s delectable seafood dishes and attentive service transport you to a European Bistro without leaving your own backyard! Or you can enjoy award-winning California cuisine with a Caribbean accent featuring fresh seafood and pasta, at the Fishwife! Both excellent choices and both located in Pacific Grove. Then there is the Rocky Point Restaurant, a scenic 15 mile drive, South of Carmel. the only ocean-front restaurant in Monterey County where diners watch for spouting whales and discover sea lions, otters, and pelicans from the deck. The seafood and the service is outstanding, you will be treated like family. If you’re looking for a wonderful breakfast experience, The Club Room is regarded as one of the best brunch restaurants in Monterey offering a fresh, seasonal, buffet featuring made-to-order omelets, assorted house made pastries and muffins, sliced cold cuts, fine artisan cheeses and much more. Monterey’s first and only craft brewery, with delicious, locally-brewed beer, Peter B’s Brewpub is a favorite among visitors and locals alike. Old World Steak House Traditions live on at the internationally acclaimed Whaling Station Steakhouse, perched just above Steinbeck’s Cannery Row. Pine Cone Properties, Inc and the San Carlos Agency are excellent companies to help with your relocation needs. A gloomy day in Salinas can turn into a pocket of sunshine at Monterey Guesthouses, the perfect destination for your vacation rental. If you are looking for a retirement community that has assisted living for you or your loved ones, Brookdale Salinas Senior Living is the place to go. Our other services include Wedding Services, there is not a more beautiful location to say “I Do” than Monterey! Meeting & Conference Services, unique venues and elegant surroundings for your event and it’s resounding success. Business & Financial, to help with wealth management. Health Care and Legal Services for your other needs in life. What more could you want or need? Monterey, California is truly a little slice of heaven.